It is typical for Samsung to produce phones of high price band, the company is one of the leader in this group in the market. Besides, the company has several models in the middle and low-end price segments, they are rather successful but now they became almost out of date. To strength position in the middle price segment the company should introduce a new handset and equip it with excellent set of features to attract a user and influence his/her choice. It’s not a secret that namely this segment has most of rival models. Traditionally the company produces not expensive models, which have a classic design. C100 is not an exception. Originally this phone will be made in silvery color, later other color solutions will be available. 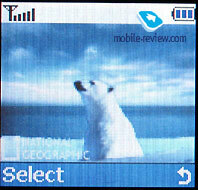 The phone’s exterior is rather unusual, side edges are raised and the keypad is placed deep into the phone. There are no problems while pressing side keys; you don’t touch the edges. All keys are made of plastic, they are well spaced and have middle size. The keypad is comfortable, it has a blue backlighting, but characters are not always visible. 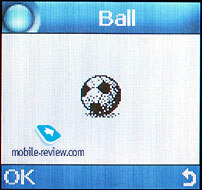 The screen is located above the keypad. 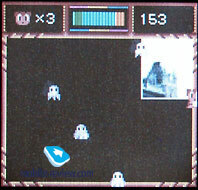 It is not large by sight, but has a resolution of 128х128 pixels. 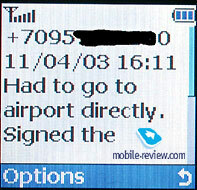 It allows to show up to 5 text lines and 1 service line. 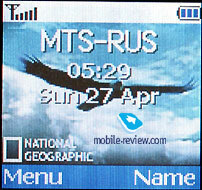 This phone is equipped with UFB-65K display. In the sunny day the information won’t be clearly visible. Even when you are inside, it is difficult to say that this dispay is really capable to support up to 65000 colors. The picture is not sharp, color rendering is worse than on similar clamshell phones from Samsung. But it is necessary to remember that C100 is a middle class handset and in this group it doesn’t have any rivals as regarded to screen quality. When firstly you take this phone, you’ll be surprised by a small thickness of the case (17mm). Engineers could reach this effect due to a lithium-polymer battery (firstly applied in the phones of this class). This battery has 800 mAh capacity. According to the manufacturer, it could provide up ot 3 hours of talking time and up to 145 of standby time. In reality the handset operated about 4 days in case of 10 minutes of talking per day (Beeline network) and up to 15 minutes of using other applications. Time of full charging is about 2 hours. 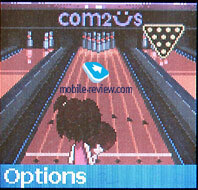 The phone has optimal dimensions (111x45x17 mm). It is neither large, nor small. It weighs 76 g., what allows to wear it as you like. We think that this model has a well-developed form-factor. 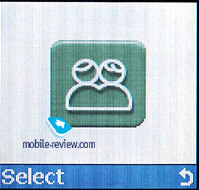 A double volume key is placed on the left-hand side of the phone. IrDA is also positioned there. 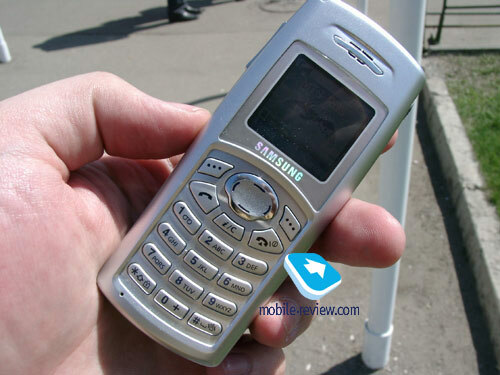 Most of manufacturers consider that IrDA is unnecessary in the model of this price segment, but Samsung decided to increase demands to the phones of this class and set it. 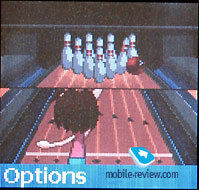 This phone has a standard menu structure from Samsung, but all items of the main menu are 3D-animated. So, when you enter a menu, you can see not just an animated picture, but full three-dimensional picture, which is almost alive. For example, you can see dew on the flowers. These pictures don’t add enrich phone’s functions, but they are very pleasant. 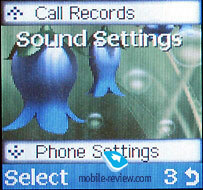 We think that Samsung is a first manufacturer, which began a mass production of the phones with such kind of menu. Don’t confuse 3D-animated pictures with 3D function. These technologies are different. Traditional lists of submenus are hidden under a renewed main menu. 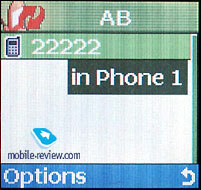 A fast shortcut number navigation is available. 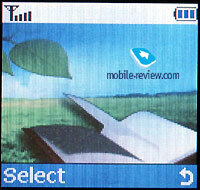 If you find time to study this phone, you’ll understand that it is a functional copy of Samsung S100. 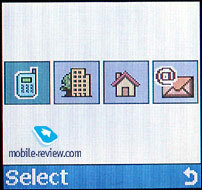 The phone has Java, GPRS (class 8) but doesn’t support MMS. It has a loud 40-tones polyphonic ringer, new set of wallpapers and pictures. To say the truth, the phone offers many possibilities. 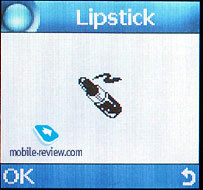 Let’s quote from the review of Samsung S100 a detail description of several features. Phonebook. You can store up to 500 phone numbers in the phonebook. 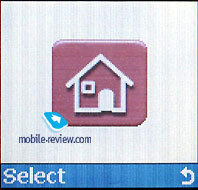 Up to 3 numbers (home, office and mobile) and e-mail address can be added to one entry. When you create a new contact, you are offered, firstly, to choose a phone number type and then to enter it. Auxiliary numbers can be entered from the edit submenu, not at once. Such arrangement has both advantages and disadvantages. It depends on how often you enter contacts with one phone number. You can organize your contacts in the caller groups. 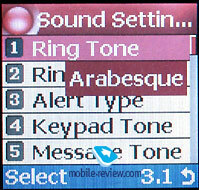 A special ringing tone and a special icon can be associated with each group. 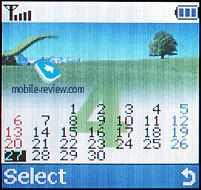 In the total list all numbers (from the phone memory and SIM-card memory) are displayed. 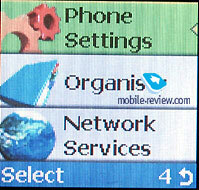 The handset provides a search by name. You can just type a first letter and a first name matching your input will be displayed, then you can type the next letter and so on. A similar find option exists in every caller group. You can setup a speed dialing for 8 phone numbers. Unfortunately, as S100, this phone doesn’t have voice dialing function. Messages. 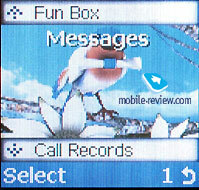 It's possible to keep up to 50 messages in the phone memory and it is not by chance. Actually, the phone supports EMS standard. So, there is a good set of icons, melodies, sounds and animation in the phone. A rather unusual set of smiles is also placed here. Funny faces have now a body. Call records. 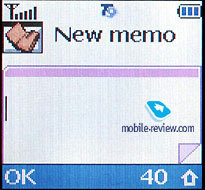 Traditionally, the lists with last 20 received, 20 dialed and 20 missed calls are hidden under this menu. You can view a date and a time for each call. A peculiarity of the phone is that the same numbers are not doubled in the list; phone number moves up and a new time and date are indicated. It is the most convenient structure for the vast majority of users. Use’s profiles are not available, but you can set an own incoming alert (light, melody, vibra, vibra+melody). It is possible to switch on a minute minder in this menu. It will operate while the talk. Settings. You can easily personalize your phone using this menu. You can set language, wallpaper (by default phone has 22 animations). Besides, you can tune screen brightness and adjust security settings. The first one is the calendar. You can add one event for each day, to add more you should copy a note of the other day, it's not handy. Here you can also view a calendar by months. 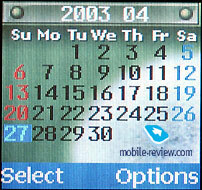 Days with events are highlighted and you can quickly move to the date you selected. Time and date. Here you can setup time and date, check the current time in many cities (a world time feature). Funbox. This submenu allows you to use your phone as Web-browser via WAP (version 1.2.1). There are also two preloaded games here. There is also a menu of applications here. 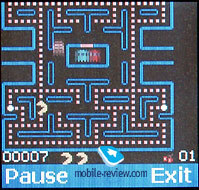 I set such games as bowling and the other favourite game – PacMan. This phone has an excellent reception quality. It didn’t have any problems. Volume of the sound is high. 40-tones polyphony is also loud; you can easily hear it when the phone is under clothes. Sometimes you can miss calls in too noisy places. In this case a vibrating alert can help you. It is average, but you can fill it rather well, probably because of the thin case. 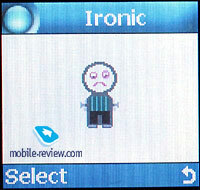 Lithium-polymer battery is the other virtue of this handset. 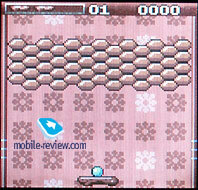 It decreases the phone’s weight and allows using a handset for a long time without re-charging. If you don’t talk much, you can use approximately 5-6 days. We didn’t find evident shortcomings and technical bugs. Originally the phone is stable and it is a great advantage of it. In the near future this phone will become one of the most popular models from Samsung and repeats success of Samsung R200/210. Samsung C100 will be available in July in the shelves of the shops and an expected price is about 150 USD. It will make the phone very popular, as there are not similar models for such price on the market. Among novelties, C100 stands out by its technological functions, which are for the first time used in the phone of the middle class. 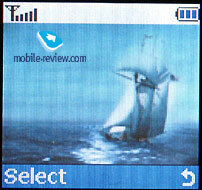 We think that namely Samsung C100 will be an outstanding product in 2003 and may be even the best in its class.